Are we live? Because I’m ready to make an announcement. The college football signing ceremony — also known as the hat dance — has been badly misunderstood. What message-board denizens have described as overly commercial and absurd is actually amateurish and rather sweet. OK, it’s also absurd. We can only be so counterintuitive. Anyway, I know this because I took my talents to Hialeah, Florida, this week to meet defensive tackle Travonte Valentine. Valentine was throwing a hat dance. Valentine is 18 years old. He is the 59th-best recruit in the country, according to Rivals.com. Valentine could attend just about any college he wanted. But that latitude also led media entities to charge Valentine, not always wrongly, with refusing to make up his mind. “They don’t know me,” Valentine said. “They don’t know what’s in my kitchen. They don’t know what’s in my room. They don’t know anything. They just assume how it is.” After National Signing Day, there’d be nothing left to assume, about Valentine’s college pick or the hat dance generally. The host of Travonte’s party was Isabel Alonso, the headmaster at Champagnat. The kids know Alonso as Ms. A. When they see her, they tuck in their shirts because you do not screw with Ms. A. Valentine’s coach, Michael Tunsil, was wearing a tie and white dress shirt. Lately, it has been Tunsil’s job to take the mail Valentine gets from colleges and put it in the trash. Travonte’s party required a lot of work. The school had rented four folding tables and four white tablecloths. As Alonso explained, “We don’t have that kind of stuff around here.” Someone brought red, white, and blue balloons. The family members arrived in white linen dresses and leopard-print stretch pants and cream-colored suits with vests. The media came to Travonte’s party — Miami’s Channel 6, 247Sports, even the Spanish-language channel Univision. Its reporter apologized for his halting English as he lobbed questions to Valentine about the SEC. There was a time when a recruit picked a college without such fanfare. At least, that’s the story. I suspect this lost era is buried somewhere near the Time When the Running Back Just Handed the Ball to the Ref After Scoring a Touchdown. Today, a signing ceremony is de rigueur. Nearly every signing ceremony involves hats. A recruit takes the hats of his favorite colleges and arranges them on a table. He picks up one hat and regards it like Yorick’s skull. Then the recruit places the hat back on the table. He chooses another hat. As a school’s hat is put down — that is, as the school is rejected — the collective hearts of its fan base go into arrest. Fans hate the hat dance. Alonso began the signing ceremony with a prayer: “Lord, we thank you for the opportunity that these young men will be signing off today …” Valentine clasped his hands in front of him, lowered his head, and dug his thumbs into his eye sockets. Below the table, I could see a cardboard box. The box contained at least one hat. The dance was about to begin. For two years, Valentine has been perhaps the least sympathetic figure on the national recruiting circuit. “Truth be told,” Chris Bello wrote on Bleacher Report, “the only thing to come out of Valentine’s entire recruiting process was simply nothing means anything and everything remains wide-open … ” I want to direct your attention to one term in the preceding sentence: the Process. The Process is the curious terms of etiquette and comportment that transform a kid like Valentine into a villain. So far, Valentine had committed to three different colleges. I asked his mother to remind me of the order. “It was Louisville first,” Michelle said. This was in May 2012. Valentine fell in love with coach Charlie Strong. After a time, he talked about other schools. He decommitted two months later. “Then he decided on Florida,” Michelle said. This time, Valentine was serious. He loved Will Muschamp, the Swamp, the Gators fans he knew from his hometown. “I’m closing down,” he told Rivals that July. “I’m solid. There’s no more visits.” That lasted seven months. Then Valentine decommitted from Florida. Valentine was 10 years old when he began to get tall and fill out. He now stands 6-foot-3 and his weight fluctuates between 315 and 340 pounds. Valentine didn’t play football until he was 13 or 14. But he was good at it immediately. When he did something like the Oklahoma drill, Michelle noticed the line of players behind Valentine was really long. The opposite line — the one for players who’d be hit by Valentine — was really short. Were you worried he would hurt people? I asked Michelle. Valentine played his first three years of high school at Bayside High, a big school in Palm Bay. His grades were poor. He transferred to Champagnat before his senior year. Four years ago, Champagnat didn’t even have a football team. The Lions still don’t have a home stadium and play every game on the road. Yet last season, they lost only one game. A little Catholic high school with 146 students and crucifixes on the walls suddenly became a forward operating base for big-time college coaches. I met Valentine on Tuesday, the day before National Signing Day. If you want to see a person drained of his life force, find a recruit on the penultimate day of the Process. In the waning days of recruiting, Valentine had become a greater object of desire. This is another irony of the Process: School hopping is OK, even a sign of thoughtfulness, if it ultimately leads you to State U. 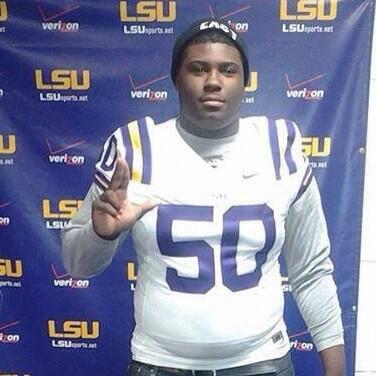 For LSU fans, Valentine’s previous decommits were immaterial. He was seen as a prize catch who would offset some in-state recruiting losses. For Miami, Valentine was only a recommitment away from helping the school establish a beachhead in its backyard. On January 24, Valentine and his mom took an “official” — that is, paid for — visit to Baton Rogue, Louisiana. Travonte went to Les Miles’s house for breakfast. He ate pancakes, eggs, ham, and other things he can’t remember. Thus began the part of the Process where fans begin to develop conspiracy theories. “He left with a briefcase,” wrote a poster on CaneSport, Miami’s hub on Rivals. Last week, Valentine canceled a final-weekend visit to Miami. He said he wanted time to think. Moreover, there wasn’t much to learn about a school he’d been committed to for months. Reporters leapt into the information void to try to read Valentine’s mind. And so we arrived at the hat dance. Remember, that’s where the Process loses its innate dignity. “We’re a Catholic school,” said Tunsil. “Our headmaster wouldn’t allow it.” I asked Alonso about a two-hat dance. She confirmed she wouldn’t allow it. The second mistake we make about hat dances is to confuse ditzy teenage humor with grave insults against the Process. Adoree’ Jackson of Gardena, California, had this year’s best hat dance. Jackson reached into a box and produced the following: a Gatorade squirt bottle, a hat from his high school team, two jewelry boxes, a shoe, and, finally, a USC hat. “The Gatorade bottle obviously represented Florida,” Yahoo’s Dr. Saturday blog noted, “but it was unclear what the other items meant.” I think they meant Adoree’ Jackson was trolling us. Good for him. Valentine said he did. He spoke in a near whisper. “Louder!” everyone cried. He reached under the table and into the box. He restarted his thought. “Happy Valentine’s Day will be … Louisiana State University.” Valentine pulled out an LSU cap. It was a purple Nike cap with gold piping. He’d bought the hat at the Barnes & Noble in Baton Rouge. He’d also ordered up a T-shirt that said “FEBRUARY 5, 2014: VALENTINE DAY.” He’d had a Miami T-shirt made, too, just in case. If you think a grave sin was committed here, I pray for you. I really do.